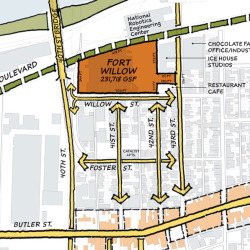 The development is located in Central Lawrenceville at Willow and 41st Street near Riverfront Park—right off of the 40th Street Bridge. Easily accessible from all directions, it is within walking distance to Butler Street shops, the Strip District and Bloomfield. Downtown Pittsburgh is 3 short miles away. Safe sidewalks, public transportation and a designated parking lot enable a variety of ways to effortlessly commute. 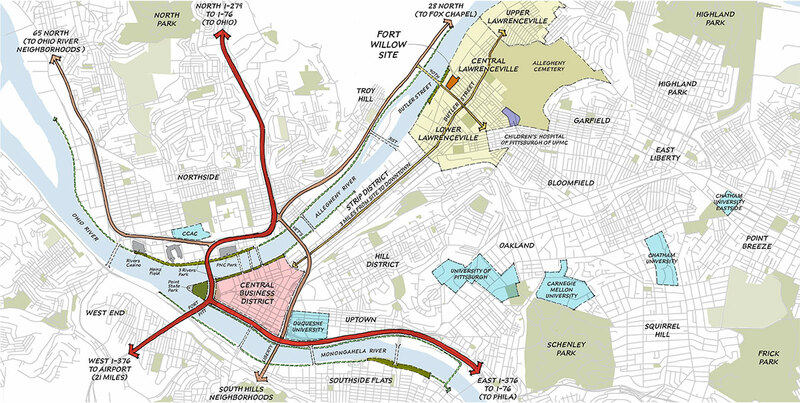 From the development you have access to pathways connecting streets, sidewalks, walking and biking trails along the Allegheny River, including the Three Rivers Heritage Trail. Allegheny Riverfront Park provides easy access to boat, kayak and canoe launches and the riverfront bicycle trail. 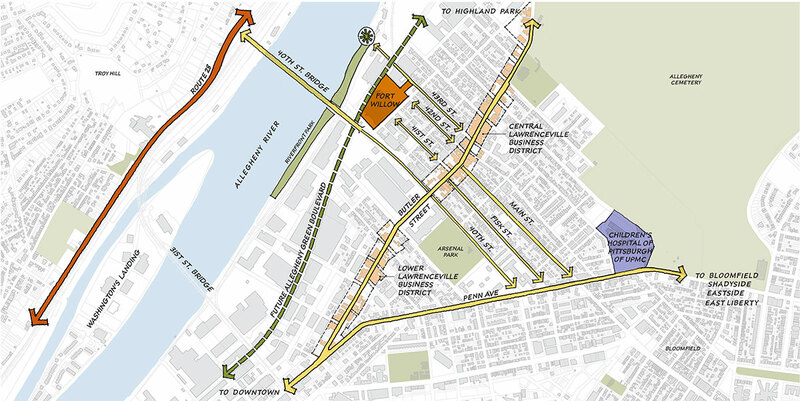 Located at Willow and 41st Streets, the site is easily accessible from Route 28 and the 40th Street Bridge. Butler Street will bring you in from Downtown and Highland Park. It is a short drive along Penn Avenue to Butler Street from Bloomfield, Shadyside and East Liberty neighborhoods. Plenty of metered, on-street parking spaces are provided. There are 6 bus routes that serve Lawrencevlle, with convenient stops along Butler Street at 40th, 43rd and Main Streets, just over two blocks away. Access to schedules, passes and service changes are easily attainable. Visit portauthority.org for more information. Accessible from 40th Street through 43rd. It is within walking distance to Allegheny Riverfront Park and Central Lawrenceville Business District, as well as a variety of local restaurants, cafes, bars, galleries and retail shops.